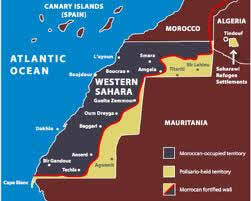 Western Sahara is Africa’s last colony; it was occupied by the Spanish in 1884 and has been occupied by Morocco since 1975. The home of a tough and determined people, the Saharawi, the people of Western Sahara, have been fighting and working for their independence and self–determination for their resource–rich nation situated between Morocco, Mauritania and Algeria. The Saharawi Arab Democratic Republic (SADR) is recognized by more than fifty nations. An armed struggle with Morocco after its occupation of most of Western Sahara ended in 1991. Almost half its people fled from the Moroccan military and live in refugee camps, now communities, in Algeria. Promises for referendums have been broken and the world either ignores the illegal and unjust situation or collaborates with Morocco, a well–supported ally of the USA. There is much international interest in the mineral deposits of Western Sahara where mainly Spanish companies began the exploitation of rich phosphate deposits that continues to this day, now by Moroccans. The Saharawi’s only participation was to provide cheap labour. These deposits and the potential for other minerals along with the rich off–shore fishery are the main reason for Morocco’s militarized occupation. Canada is negotiating a Free Trade Agreement with Morocco, it in turn is supported by the province of Saskatchewan where the agriculture minister says that Morocco is a major market for its agricultural products and he wants trade barriers removed. The giant Saskatchewan Potash Corporation buys phosphates from Morocco, much of which originate in Western Sahara mined by a company owned by the Morocco government. In spite of the many UN recommendations, Morocco still rules Western Sahara. The portion of the state along the Atlantic coast has received so many Moroccan migrants that they now outnumber the Saharawis who are constantly subjected to surveillance, harassment and detention which may result in torture and lengthy jail sentences. Resolutions #242 & #338 of the UN Security Council include statements that prohibit permanent settlement of occupied lands for domestic or commercial purposes; resolutions that Canada professes to respect. International law also recognizes the rights of colonized peoples as in the case of East Timor. The Fourth Geneva Convention prohibits (and makes criminal) settlement of a population into the occupied lands of others. A narrow strip to the east and south is a “liberated zone” with little development and few people; this strip is separated from Morocco and the western region of the state by a more than 2000 km long earth wall liberally planted with landmines. Before this barrier was constructed by Morocco thousands of Saharawi fled from their homeland, pursued by the Moroccan air force dropping napalm and white phosphorus on terrified civilians. Recently there has been some success in raising awareness of this little–known issue. An important EU fishing treaty with Morocco has not been renewed. The illegal export of mineral products from Western Sahara is gaining attention; the Arab Spring showed us that change can be sudden and unexpected by outsiders. PLEASE WRITE TO: William J. Doyle, President and Chief Executive Officer, Potash Corporation of Saskatchewan Inc. # 500, 122 – 1st Avenue South, Saskatoon, S7K 7G3, SK and ask that Potash Corp. stop buying phosphates from Western Sahara and for Potash Corp. to support an end to colonization of Western Sahara so it may buy phosphates from the legitimate owners of the resource. PLEASE WRITE TO: Chad Ulansky, President & CEO, Metalex Ventures Ltd., 203– 1634 Harvey Avenue Kelowna, BC, V1Y 6G2 and ask that his company relinquishes its exploration permits in Western Sahara, granted by Morocco, until the legitimate government of the SADR is re–instated.